This five-piece Middle Eastern/gypsy/Balkan fusion band brings you original sounds evoking a rich span of moods, from the sultry depths of the Middle East to the meandering slopes of the Balkan hills. Middle Eastern percussion and rhythms form the backdrop to soulful vocals, playful mandolin melodies and rich saxophone sounds. And finally, a mesmerising Tribal Fusion bellydancer to leave you enchanted. Ottoman Slap features Raoul Spiegel, James van Minnen, Simone Chiara, Marissa Cuenoud and Callan Wolff. 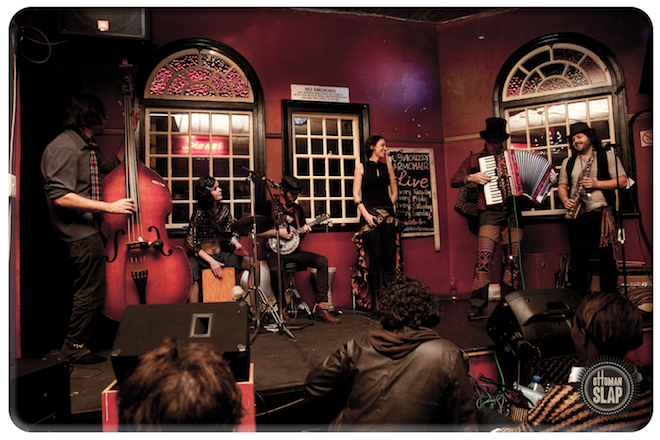 This five-piece troupe sprung from the Capetonian creative woodwork in late 2012. With various multi-instrumentalists, the band features lead vocals, saxophone, flute, mandolin, guitar, accordion, double bass, cajón, darbuka, frame drum, zills, castanets, saw and hulusi. They also offer something very unique: Tribal Fusion bellydance performed to selected songs by the very talented Marissa Cuenoud. Ottoman Slap performs both original compositions as well as traditional music with a twist – adaptations of anything from Middle Eastern pieces to Andalusian and Romanian folksongs.